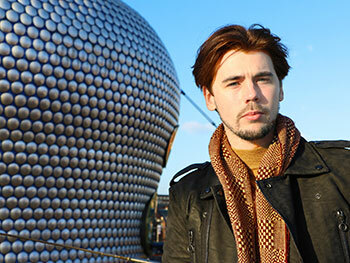 BCU graduate and up-and-coming Birmingham talent who is creating a stir in the fashion industry is showcasing his dress designs at Selfridges - made out of redesigned coffee pods. Rhys Ellis’ unique fashion collection is on display at the Selfridges Birmingham store for the next three months. 25 year-old Rhys, originally from Kings Norton and now living in Shoreditch, came up with the idea after moving to Milan to study at Politecnico di Milano design school alongside world-renowned tailor, Guiltiero Fornetti. Rhys’ time spent in Milan formed part of his undergraduate degree in Fashion Design at Birmingham City University. “The year in Italy was a great experience for me. Not only was I being trained by one of the world’s most distinguished and experienced bespoke tailors who, at the age of 74-years-old, teaches some of the most up-and-coming talent from brands such as Armani and Versace, but there is a coffee culture that I hadn’t seen before”, said Rhys. “It was while I was in one of the markets that I saw a lady making very simple jewellery from these coffee pods and something just clicked and I knew that I could create dresses this way. I also liked the idea of using material that would otherwise be thrown away. “I came away from Milan knowing so much about the industry, but also with an idea which I knew would translate into my fashion career and push it forward”, added Rhys. Rhys creates each of his dresses by hand, made with 6,000 repurposed coffee pods. The Spring/Summer ‘17 collection, on display at Selfridges, is based on the theme of underwater, evolution and the effect the environment surrounding us can have on progress. Rhys’ standout work forms part of Selfridges’ ‘Material World’ project which looks at how materials are made and how to make them more sustainable. “To see my work on display at Selfridges is just incredible. I used to work in one of the concessions at the Birmingham store when I was studying and now to see my work on display in my city just makes me so proud”, said Rhys. Sam Watts, general manager at Selfridges Birmingham, said: “The dresses have only been on display for a few days and already many of our customers are stopping and noticing them. For us to be able to proudly display and support the work of an upcoming and talented Birmingham fashion designer in his home store is an honour. We know that Rhys is going to be moving onto incredible things in his future. We’ll be proud to have been able to help in our own way.